LAKE HOUSTON MARCH CRAPPIE TOURNAMENT (UPDATE) - Lake Houston Fishing! The tournament will be held March 16, 2013 from 7am to 3pm. The weigh in will be at B.J.’s Marina, 27907 Calvins Road, Huffman, Tx 77336. This is a 2 man team event (2 people per boat). Entry fee is $30 per person ($60 per boat). Each team will enter 7 fish at the weigh in. Money collected will be paid out for the top three heaviest 7 fish strings and the big fish of the tournament. You can enter at B.J.’s Marina anytime until the start of the tournament. No more entries will be accepted after 7am , 3/16/2013. 1. Two people per boat, $30 per person. $5 goes in big fish pot, balance pays top three places 50%/30%/20%. 2. No more than 7 fish will be weighed in per boat at end of tournament. 4. Tournament hours are 7am till 3pm. This means Line in water no earlier than 7am and out of water by 3pm. 5. You must be in the weigh in line at B.J.’s marina no later than 3:30pm. If you are not in line by 3:30pm you will be disqualified. 6. You can use any legal means to catch your fish. Do we have to have two people in boat? Yes sir.......Team event with 2 people per boat. this board only about every four or five days. Sorry for taking so long to get an answer to your question lil bluegill. 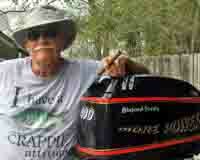 I talked to jim butz and we agree that you can fish by yourself if you want. Some folks my not have a big enough boat to fish 2 people and we want to allow them to compete. So, each boat/team will consist of a maximum of two people. 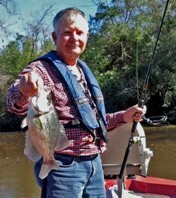 Don, if a person fishes solo, is his entry fee $30 (each) or $60 (per boat)? It would only seem fair to me that it would be $60 per team with a max of 2 people per team. I say that because you turn in a team stringer and the winner money is based on a stringer weight whether there is one or two in a boat. I ain't in the tourny or making rules though. twice as many fishing holes to go to. but it is up to the tournament director. Yes but it is a team tournament. So, the entry should be per team. Whether your team is 1 or 2 people, it's still a team. Think of it like you would a baseball or softball tournament. Whether your team has 9 people or 14 people, you still pay a team entry to play ball. You don't pay the tournament entry depending on the number of folks on the team, it's a team entry and if you have enough folks for bench warmers it's the same price as if you showed up with the bare minimum. trying to build up their club. The entry fee is $30 per person. Each boat will be able to enter 7 fish at the weigh in. The maximum number of people per boat allowed is two. 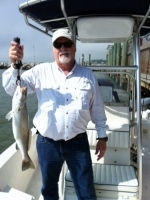 We are allowing you to fish by yourself because we are trying to encourage as much participation as possible. We think some people would not fish if they have to fish with a pardner. I see a lot of folks fishing lake houston by themselves in little jon boats all the time. We want them to fish the tourney if they so desire. I know this doesn't much because the weatherfellers can't predict weather from one day to the next but they are forecasting the wind to be 10 to 20mph outta the south come saturday Thats going to absolutly kill some of the areas I've been fishing but it will open some other areas up!!! !